How Will We Sustain Alligator Gar Populations? 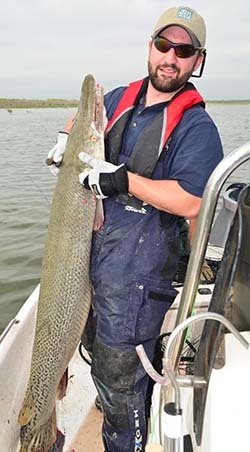 A primary goal of TPWD’s alligator gar management is to maintain or improve our populations in Texas. In the Trinity River, this objective includes retaining fishable numbers of the largest, recreationally valuable fish. Because relatively few alligator gar can be sustainably harvested each year, it's important to closely monitor both reproduction and harvest. Texas currently has a statewide bag limit of one alligator gar per day, with a special limit of 5 per day on Falcon International Reservoir. In addition, the department has the authority to close waters to alligator gar fishing when conditions are appropriate for spawning. To help keep populations in good shape, the Texas Parks and Wildlife Commission has enacted a set of new regulations to take effect September 1, 2019.